Join us for a very special tour on Mariner's Day, Sunday, May 19, 2019! The entire Light Station will be open to tour with free transportation and light refreshments provided! Included with interior tours of all the historic structures (lighthouse, keepers house & whistle house) is a complete viewing of the solar and wind electric-generating systems. Also for viewing, the solar thermal system; hot water and central heat from the sun! The tours are free but donations are greatly welcome! From 9am until 2pm, rain or shine, come visit us. Meet at the lower level parking lot at Race Point Beach for a free ride to Race Point! (Last ride to the lighthouse is at 2pm.) Please Note: No pets/ animals are permitted. Please contact Ron at Email for additional information regarding tours. Want to learn more about this fun-filled annual event? Click here to read the details of our 2015 Mariner's Day tour! The Race Point Lighthouse will be open for touring on the first and third Saturdays from June until October. You can get to the lighthouse by walking or your own four-wheel drive vehicle with the proper permit; we do not provide public transportation for the tower tours. The lighthouse will be open from 10:00am to 2:00pm. All donations are deeply appreciated and directly benefit Race Point. Stop by on your way to Hatches Harbor! May 19 - Special Tours for Mariner's Day (Hours: 9am-2pm)! Don’t forget your camera. There is even a gift shop! 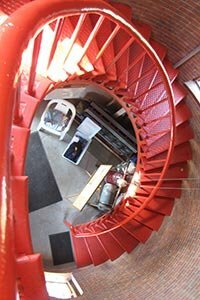 Email Ron at rplkeeperforms@racepointlighthouse.org for more information regarding the tower tours. Note: The touring season will be suspended if any of the various federally-protected shore birds have nested and block access to the lighthouse. Once the chicks fledge, tours will resume. Only 5 people at a time inside the lamp room. When in the lamp room be very careful of the trap door. No one is allowed outside on the gallery (catwalk). Children must be supervised at all times by a parent or guardian who is at least 18 years old. Children under age 4 are not permitted to climb the ladder from the watch room to the lamp room. Appropriate shoe wear is mandatory at all times; no flip flops. No pets/ animals are permitted.